John M. Collard, Chairman, Strategic Management Partners, Inc. has agreed to write a column for Smart CEO Magazines. This column provides insight for board of director members, company leaders, investors, lenders, and stakeholders interested in the turnaround leadership and investing process. John Collard said "I am honored to be part of the Smart CEO program and contribute to this effort. These are interesting times for businesses in a troubled marketplace. Turnarounds are a lot like start-ups – they must build teams, differentiate and sell products and services, secure capitalization, and grow. It is a disgrace for CEOs and boards of directors who allow their company to become distressed and watch value deteriorate." Collard continued. "Turnaround specialists can be an option to stabilize the situation and rebuild value. Turnaround management strategies will certainly play a key role in recovery." John M. Collard is a Certified Turnaround Professional (CTP), and a Certified International Turnaround Manager (CITM), who brings over 35 years senior operating leadership, $85M+ asset and investment recovery, 45+ transactions worth $1.2B, and $80M fund management expertise to run troubled companies, serve on and/or advise company boards, litigators, institutional and private equity investors, and raise capital. John has parachuted in as the Interim CEO, CRO or senior executive to turn around troubled entities, and serves as an outside director. John is Chairman of Strategic Management Partners, Inc. in Annapolis, Maryland. John is inducted into the Turnaround Management, Restructuring, and Distressed Investing Industry Hall Of Fame. 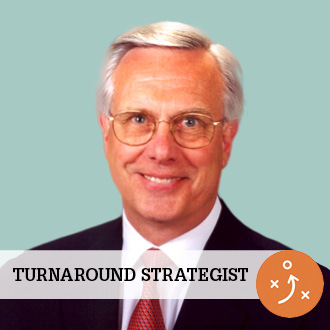 John is Past Chairman of the Turnaround Management Association (TMA), Past Chairman of the Association of Interim Executives (AIE), and a Senior Fellow of the Turnaround Management Society. John is a Founder of TMA. John was honored as Prince Georges Business Leader of the Year. John is honored with the Interim Management Lifetime Achievement Award from the Association of Interim Executives. John is a Maryland Most Admired CEO. SMP (www.StrategicMgtPartners.com 410-263-9100) is a turnaround management firm specializing in interim management and executive CEO leadership, asset and investment recovery, board and private equity advisory, raising money, and investing in and rebuilding distressed underperforming troubled companies. The firm has been advisor to Presidents Bush (41 & 43), Clinton, Reagan, and Yeltsin, World Bank, EBRD, Company Boards, and Equity Capital Investors on leadership, rebuilding troubled companies, investment recovery, turnaround management and equity investing. SMP is celebrating 25 years of service to its clients. SMP was named Maryland's Small Business of the Year, and received the Governor's Citation, State of Maryland as a special tribute to honor work in the areas of turning around troubled companies and saving jobs in Maryland. Turnarounds & Workouts Magazine twice named SMP among the Top Outstanding Turnaround Management Firms. American Business Journals named SMP among the Most Active Turnaround Management and Consulting Firms in Baltimore, Washington, and the Mid-Atlantic Region. Global M&A Network Turnaround Atlas Awards named SMP as Boutique Turnaround Consulting Firm of the Year. SMP is winner of Corporate Intl Magazine Global Award for Interim Management Specialist Firm of the Year. SMP is recipient of the Turnaround Management Firm of the Year Award by Acquisition Intl Magazine.